Apple has revealed its latest generation of its iPod shuffle music player, featuring playlists, voice-control and buttons and a new smaller, multi-touch controlled iPod nano. The new iPod shuffle will let you listen to your music for up to 15 hours, according to Apple. In addition to featuring iPhone and iPod touch-style multitouch control, the tiny new iPod nano is almost half and small and half as light as its predecessor. It also features a clip, so you can wear it, as you can with the iPod shuffle. 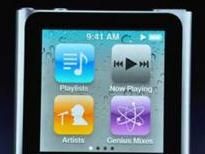 Perhaps the most impressive claim is that the new iPod nano will allow 24 hours of music playback. Jobs also demonstrated how photos looked on the dinky new iPod nano. The new iPod shuffle will cost US consumers $49. The new iPod nano will sell for $149 for 8GB version and $179 for the 8GB version in the US when it launches later this year. UK pricing is as follows - the 2GB iPod shuffle is £39, the 8GB iPod nano is £129 and the 16GB iPod nano is £159.